This fall, Brehmer Theater was one of the first places on campus to come alive with the energy of the incoming class. Echoing through the halls of Dana Arts Center, the tune “Hello” from the musical comedy The Book of Mormon played on repeat. On stage, six first-year students broke into song, struggling with the overlapping voice parts and laughing at how impossible the song seemed to be. Returning students cheered them on, encouraging them to embrace the challenge and step out of their comfort zones. These first-years came to Colgate three days in advance of the official arrival day to participate in a pre-orientation program for the student theater group Masque and Triangle. Over three days, veteran theater students facilitated workshops on improvisation, sketch comedy, and play production. 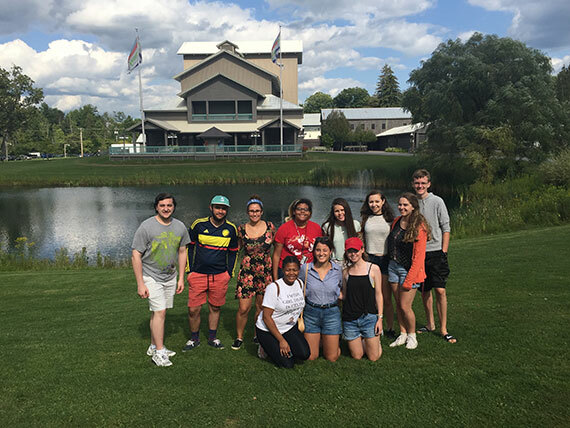 The group also traveled off campus, visiting the Glimmerglass Festival in Cooperstown, N.Y., where they met with Joel Morain, Colgate University Theater’s technical director. The students took a backstage tour of the theater company’s current production, giving them a firsthand glimpse of how professional shows are produced. Pre-orientation programs allow first-year students to arrive on campus early and immerse themselves in an area of interest. Other programs were led by students involved in Outdoor Education, WRCU radio, Pep Band, the Maroon-News, and the Colgate Activities Board.